Click here to learn more about the Abuse Hurst. To help support abused women and children by donating your old vehicle and for more information click here. 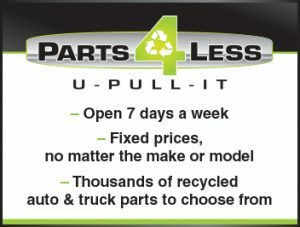 Dom’s Auto Parts & Parts 4 Less U Pull are proud to be sponsoring Autofest 2018, August 25 and 26 at Lakeview Park in Oshawa. We will be there raising money for a great cause, the Grandview Children’s Centre. The Grandview Kids inspires possibilities for children and youth with special needs in Durham Region. Make sure to eat your Wheaties and get ready to smash some cars to help support some great children. Looking forward to seeing everyone there! Visit autofestoshawa for more information or how to register. Visit grandviewkids for more information on the Grandview Children’s Centre.